Burlap & Satin is the now out-of-print 25th solo studio album by Dolly Parton. Released on June 18, 1983, it straddled the line between pop and country sounds. Consisting mostly of Parton's own compositions, two tracks were outtakes from the Best Little Whorehouse in Texas film: "A Cowboy's Ways" (a song intended for costar Burt Reynolds to perform in the film, that was ultimately cut out of the film) and "A Gamble Either Way". The album's single, "Potential New Boyfriend" was a top twenty country single, and was accompanied by Parton's first ever music video. Willie Nelson duetted on a cover of the Eddy Arnold hit "I Really Don't Want to Know. 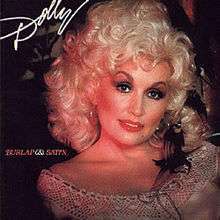 As part of Parton's 2007 European tour, the album was re-released for the first time on CD by BMG Germany (a division of Sony/BMG) in a two-fer CD. It was paired with 1985's Real Love. All tracks written by Dolly Parton except as noted.